Every so often, I’m struck with a metaphor for something five-fold and I just can’t shake it until I blog it! Should I make that into a T-shirt? When inspiration strikes, you know…start printing shirts that no one wants! That’s what I always say. Aside from being one of my guilty pleasure favorite movies, National Treasure contains one of the most obvious APEST metaphors around. There’s a scene and sub-plot that helps us understand not only what the five-fold gifts do, but how they can change the way we see the church through them. Before we check out the clip, let’s review: In Ephesians 4, Paul describes who a Christian is in the Body of Christ. Ephesians 3 is all about our identity in Christ, but four gives us a vision of what it looks like to be us as a people. These five gifts are people-gifts, people who operate in the church as apostles, prophets, evangelists, shepherds and teachers. Maybe in the next post, we’ll look at how these gifts show up differently in different people at different times, but that’s not the point of this one. Through the five-fold gifts, the church can see itself as it was created to be seen. With all these gifts acting together in concert, the Church ceases to be the hour on Sunday, people look for an excuse not to go to, and instead, because a thriving center point of missional life that God sent to serve the world – when the five fold are alive and thriving in the Body of Christ. So, on to the metaphor. In the film, National Treasure, a small team of adventurers has to locate a hidden treasury before a group of thieves can steal it. To accomplish this, the good guys have to…ahem…steal the Declaration of Independence which conceals the the final clue to finding the treasure – a hidden hologrammish thing. The problem is, when they look at the document what should be seen, isn’t seen. To the naked eye, the clue, the thing that will make the whole adventure makes sense, isn’t visible. So, they have to find a pair of glasses built by Ben Franklin. It so happens that the Franklin glasses have five lenses. Super-spectacles? Pentacles? By using these lenses they are able to see the clue hidden on the back of the Declaration of Independence. The invisible becomes visible. 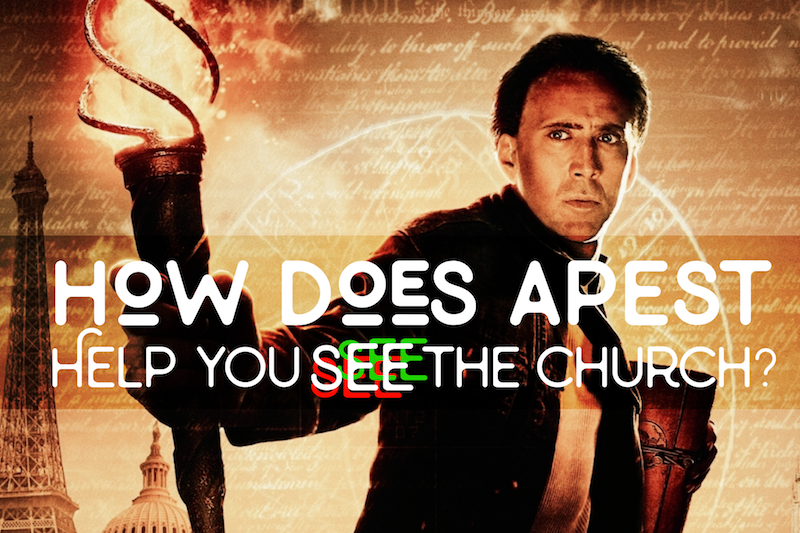 In the same way that the 5 lenses allow Nicholas Cage to see the clue that will unlock the treasure, the five-fold gifts are the way to make the invisible dynamics of the Church visible. The issue that I’m addressing is not a five-fold church however, but a two-fold one. You can read in a variety of posts how our modern expression of the Body of Christ has been reduced to the ministry of the Teacher and the Shepherd. One cares for the sheep and the other teaches them. The problem with this is, it’s not the Biblical intention for the Church (or at the very least, not the full extent of it). The Church is a sending agency, a lighthouse that points out danger in the darkness. We are an equipping station for people on the go. Our actions are a mirror of the actions of our Lord, Jesus. If it don’t look like Jesus, it ain’t worth doing -is that another shirt? Nevermind. Think of a movie. What if everyone on the film set was either a writer or a caterer? What if everyone was an actor but there were no camera operators? Or directors? Or, I guess, more frightening, what if everyone on set was either a director or a producer? It would make a great horror movie if you filmed it, but that is not a team that could make a great film! Ever look at the credits? Have you seen how many different people it takes to make a movie? It isn’t much different for the Church. We are people-gifts with ability-gifts. That’s what makes the thing so awesome. When the Church is all apostly, prophetic, evangely, shepherdy and teacherly, that thing rocks! You can hear it coming! It’s time to see the Church the way we were meant to be seen, created to be seen: through the five-fold gifts of the Apostle, Prophet, Evangelist, Shepherd and Teacher. When we have room to be who we are, who we are created to be, everything the Church is meant to be becomes obvious. ** The RUSH reference is an Easter Egg…see if you can find it.